The designer label's signature Japanese Paper material is made from all-vegan materials and gives this clutch bag a distinct contemporary style. 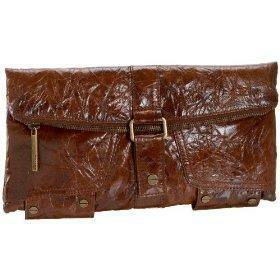 The crinkled texture is a staple for the brand's bags but is as pretty and unique as ever in this cognac brown color. However, the manmade leather isn't the only feature of the Sade that contributes to the clutch's urban chic feel. The top of the bag might zip, but that's not the main closure. After folding down, a strip of material slips through a square-shaped ring and secures at the bottom. It's an unexpected addition that is really more decorative than practical but the look is stylish. A minimal amount of screw-head hardware completes the modern appearance as do the subtle logos on the top corner and zipper pull. The interior of the Sade is lined in faux suede made from recycled plastic. This Matt & Nat clutch retails for $135. The Rebecca Minkoff Eyelet Rocker Bag, a great alternative to this contemporary clutch.